A change to Irn Bru's recipe has prompted panic buying behaviour from fans. The soft drink will be made with a lower sugar content from January 2018. It is believed the change was influenced by the recently introduced 'sugar tax'. There was one BBC News story on 4 January that made Business Management subject controller and TPE lecturer Lauren O’Brien smile; the panic buying of fizzy juice. Panic buying, as you will know, is quite unusual in practice, and is often associated with serious events - such as extreme weather conditions, fuel shortages, and so on. So, what has prompted this somewhat unusual behaviour across Scotland and what lessons are there for business management? As the BBC discuss, Irn Bru's manufacturers are changing their recipe by reducing the sugar content from January onwards. Given that our student blog is read worldwide on a daily basis, there is a chance that some readers are not familiar with the product. For those that haven’t sampled it, Irn Bru is a rather unique, carbonated, orange-coloured beverage, albeit not orange flavoured - the flavour is actually a little hard to describe. It has a somewhat banana, bubblegum and metallic tang to it! But it’s that very flavour which has endeared itself to Scotland – so much so that Scotland is the only country in the world where a non-Coca Cola branded drink outsells the world’s favourite fizzy drink manufacturer. Word that the recipe is changing has sparked panic-buying, with long-term fans of Irn Bru are stocking up on the old recipe, assuming that they will not like the new reduced-sugar version. How does this relate to the CA qualification? This particular situation can be analysed from the perspective of a number of different ICAS subjects and levels. For example, it fits well with the ideas of business strategy, pricing and marketing introduced in TC Business Management, and the concepts of supply and demand covered in TC Finance. TPS ABS would likely analyse in more depth any risks associated with this strategy. While not covered in TPS Tax, we have all likely heard of the 'sugar tax', and can probably understand some of Irn Bru’s motivation behind the reduction in sugar in their recipe. Analysis shows that if producer AG Barr were to keep the recipe, 24 can packs of Irn-Bru would need a 30% price rise. And for TPE - well, this type of situation could easily fit into a larger case study scenario! A sugar tax for health? 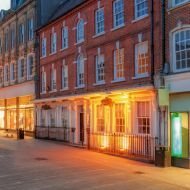 Should business rates be scrapped?